MICHELLE Obama has proved that she is the First Lady of press-ups by nailing 25 of them on television. 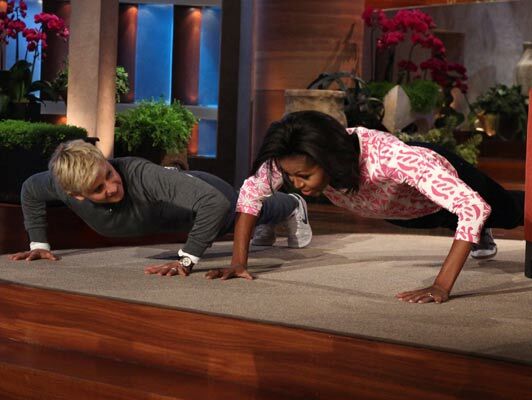 Barack Obama’s wife accepted a press-up challenge from chat show host Ellen Degeneres — and outdid her by five. The contest was watched by a studio audience that counted the lifts out loud and cheered when Michelle won. 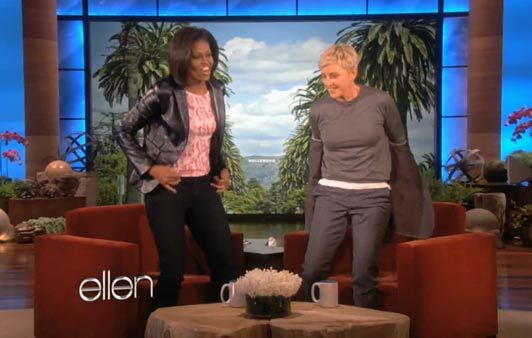 Ellen quipped: "I thought it wouldn’t be good to show off the First Lady so I stopped. "Because I thought, this looks bad that I’m going to beat her." She added jokingly that the age gap of six years played to her disadvantage: "I’m 54 and you’re 48." During the show Michelle also revealed a bedroom secret about her US President husband — he doesn’t pick up his socks. She said: "He thinks he’s neat but he has people who help him. "I’m like, it’s not you that’s neat. It’s the people who pick up your socks. "Those are the neat people." Michelle was on the LA show to promote her healthy eating and fitness campaign, "Let’s Move". On Tuesday she fed The Tonight Show’s host Jay Leno food she had brought from the White House kitchen garden.